Sean Burnet is a specialist Obstetrician & Gynaecologist. He completed his training at the Royal Hospital for Women. He also has completed a Fellowship year in advanced laparoscopic and pelvic surgery through Sydney West Advanced Pelvic Surgery Unit. Sean Burnet as well as working at North Shore Private works at The Mater and Royal North Shore Hospital. He teaches medical students from The University of Sydney and The University of NSW. Sean Burnet ensures his patients receive a personalised service and caps the number of Obstetric patients he cares for to ensure this is achieved. He has experience looking after high risk pregnancies and very much enjoys his work, this is demonstrated in his approach to patient care. We have been very lucky to have Sean deliver both of our boys at the Mater Hospital in the last 2 years. Throughout both pregnancies I found Sean very professional and whenever I had questions outside of appointments he always made himself available via phone/text to answer any questions/concerns I had which was very helpful and calming at times for me and my husband, especially on our first pregnancy. He listened carefully to my birth plan and took into consideration my wishes for both births and was very reassuring as it got closer to my due date with any concerns I had regarding the birth. Overall I would highly recommend Sean. Both births went very smooth and if we have a third we will definitely go back to Sean again. Having clinics in numerous locations was also very helpful especially for people who are located in The CBD and unable to travel to the hospital for appointments. Sean provides thorough and individual care and I felt comfortable and listened to when sharing my birth preferences towards the end of the pregnancy. Throughout my pregnancy Sean’s calm persona, attention to detail and time to answer questions put me at ease. During my labour and birth Sean reassured us and worked with us on our preferences whilst always ensuring my baby and I were safe at all times. I would recommend Sean to friends as an Obstetrician who puts his patient and her needs at the core of his practice. I was recommended Sean by a friend. My pregnancy and the birth of our first child was a very special time which also came with some challenges along the way however Sean was at the other end of the phone when needed. Our GP recommended Dr Sean Burnet and we couldn’t have been happier with our choice. From the first time we met him we knew that he would be caring, thoughtful and professional. Throughout the pregnancy he answered all our questions whilst also educating us on what to expect. This was our first pregnancy and I can most definitely say we will be going back for any subsequent ones. Dr Sean Burnet was recommended to us via my GP and I would highly recommend him to anyone looking for an Obstetrician. We didn’t really have any idea what to expect but Sean and his team were able to answer all of our questions and talk us through the options. Sean was extremely supportive and attentive throughout all of the appointments. Our daughter was born safe and safe on 17 October 2018. Sean’s calm and kind nature was exactly what we needed during my pregnancy and delivery. I felt comfortable and supported in Sean’s care. Thank you Sean and team! I was seeing Dr Sean Burnet as my GYNAE so of course he looked after our prenatal care right through until the arrival of our baby girl and of course I used him when I fell pregnant again 5 months later with our baby boy. With 2 very different pregnancies and deliveries I cannot recommend him and his very attentive and friendly midwives Ben & Rebecca enough! Dr Burnet is calm, diligent, knowledgeable and kind and a god send through any pregnancy! I was always intent on a vaginal birth however during labour we discovered the cord was wrapped tightly around my daughters neck, she was in distress & a emergency cesarean was required, Dr Burnet was calm and supportive throughout the whole procedure and my baby was delivered safe and sound. After discovering I was pregnant again so soon we had to schedule a cesarean in as my body would not be ready to try for a VBAC labour. Again throughout the pregnancy and labour Dr Burnet was fantastic helping me and guiding us through until my post care. The incision remains small, tidy and is recovering very well. Now we have two gorgeous heathy and happy babies who thanks to Dr Burnet were safely delivered (especially my daughter as she would not have survived a natural birth). I can’t recommend him highly enough and now we can go back to GYNAE care. Dr Sean Burnet looked after our prenatal care right up until the delivery of our baby girl and we couldn’t be more pleased with his support, guidance, advice and care during this time. Dr Burnet is caring, friendly, diligent and empathetic. He was always checking to see how my husband and I were feeling in the lead up to the birth and was supportive to us as a couple and as individuals. In our situation, our baby girl was breech the whole way through. We had always intended on a vaginal birth however we had to plan for a C section in the end as she refused to turn. Dr Burnet explained the whole procedure to us and put my concerns to ease whilst also providing alternatives we could consider. On the day, the operation was very smooth, there was no pain during the procedure, it was a very calm process and the incision was small, tidy and is recovering really well. Now we have a beautiful and heathly baby who was safely delivered all thanks to Dr Burnet. I can’t recommend him highly enough and should we be fortunate enough to have more children in the future, I will happily return to Dr Burnet for my obstetrics care. Additionally, we had very attentive and friendly care from the midwives in his office as well. I cannot recommend Dr Burnet enough. The level of care from Dr Burnet and his team is second to none. Dr Burnet listened to every concern I had and was extremely supportive in every decision I made. I will definitely be seeing Dr Burnet again for future pregnancies! Dr Burnet was recommended to us and we could not have asked for a better obstetrician. Pregnancy for a first time mum can often be an overwhelming time but I always felt supported and cared for by Dr Burnet and his team. I felt well informed and in control of all the decisions associated with my pregnancy and Dr Burnet didn’t hesitate to answer any questions or concerns I had. I would not hesitate to choose Dr Burnet to manage any future pregnancies or recommend him to friends or family. I chose Dr Burnet specifically after seeing his professional and caring nature when he was looking after my sister during her pregnancy. Dr Burnet firstly looked after us with our first pregnancy that resulted in miscarriage. He was compassionate and very thorough with assisting in booking a D&C and our post op care. We chose him for our second pregnancy because we knew we were in good hands, and it was the best choice we made. Not only are Dr Burnet and his team of midwives so involved and thorough with their care, they were available for any and all questions that me and my husband had. Couldn’t recommend a more amazing obstetrician than Dr Sean Burnet. We will definitely choose him for our next pregnancy. Dr Burnet is amazing. He really cares about his clients. Despite being a first time mum at the age of 43, I wanted a drug free natural birth. Dr Burnet kept me informed with all the pros and cons as well as potential risks of going overdue. With his help, I had a super positive birthing experience. Highly recommend Dr Burnet to anyone who is looking for an OB. Dr Burnett was everything and more I’d hoped I would have in an obstetrician. Sean managed our miscarriage and consequent D&C for our first pregnancy with such care and gentleness. I truly belief how he dealt with the situation meant that we were able to look forward with excitement and confidence. Sure enough I was pregnant again soon after and delivered a healthy baby boy 11 days ago! From go to woah, Sean was a professional, thorough and genuinely lovely to see with each visit. He gives the amount and depth of information that you want to know and we never felt rushed or that a question was left unanswered. I had very severe morning sickness and getting up to get to appointments was pretty much the only thing that I managed with some level of excitement! My husband and I both value how people treat those around them and so the fact that my two midwife friends knew him and spoke very very highly of him meant a lot to us. Ever since, every midwife we have been in touch with since choosing to go with him has lauded his praise. When it came to delivery again, I honestly cannot fault Sea’s manner and attentiveness. I felt like I was in the best care available and I trusted him with every ounce of my being. My only reluctance in writing this review is that we want a second and I don’t want him to be booked out for us! But that’s selfish. He deserves every success in the world. Dr Burnet has been incredible the whole way throughout my pregnancy; from the very first appointment at 8-weeks, through to little lady making her appearance at 38-weeks, he has provided nothing but professionalism, kindness and expert advice – without him I would have been lost and we can never thank him enough for his services. I have never met a Doctor (or individual for that matter) with a calmer and more patient bedside manner. During the birth, I found it got a bit overwhelming towards the end, but Dr Burnet’s sheer presence and support was enough to help me focus on the task at hand, and I felt incredibly reassured that it was him bringing our baby into this world – I would never be able to entrust this task to any other Doctor now. If we were have another baby in the future, my husband and I would never consider anyone other than Dr Burnet and we wholeheartedly recommend his services to other parents-to-be. He was very helpful to me throughout my second pregnancy. I was a very anxious pregnant lady because my first baby was stillborn (NOT with Dr. Sean) but Dr. Sean was tremendously patient with me. I love it that he is very knowledgeable and caring at the same time. He answered all my questions during my check-ups, always on time, returned my calls and text messages when I need to refer something, he even assisted when I needed to sort an issue with my private health insurance. After delivery, he came to check on us several times while at the hospital. He goes above and beyond the call of duty because he truly cares for his patients and he is a man of excellence. For my next pregnancy, I don’t need to see any other obstetrician because I know that he is the best there is. Choosing a obstetrician for your first pregnancy and delivery can be a bit of a minefield! From our first appointment with Dr Burnet and his team, we knew we were in good hands. Dr Burnet is knowledgable, accessible and approachable. We had a very straight forward pregnancy but had some issues towards full term that impacted on delivery. What could have been a stressful end to an otherwise wonderful pregnancy was expertly managed by Dr Burnet. He and his team provided reassurance and advice to help us smoothly navigate the issues to have a fantastic delivery. Thank you Dr Burnet and team! I am glad I chose Sean as my obstetrician, I could not have asked for a better one. From the first consult, I was completely comfortable with him. He answered every question I needed to ask and eased my mind with each appointment by doing an ultrasound to ensure my little one was ok. My Family do not live in Australia so it Is nice to have this footage to show them, which he gave to me on a USB. He was outstanding on the day of the birth and his calm voice got me through some tough contractions. I had wanted a natural birth with no epidural and with his encouragement, I achieved this. I have already recommended him to friends and will not hesitate to book him again if I have another child. He also calm to visit me a couple of times in the hospital after the birth to ensure I was ok which was great. Thank you Sean and your wonderful team. Sean was recommended to us and we could not have wished for a better obstetrician. We had most of our appointments with Sean at his rooms in the CBD and always left feeling calm and reassured. He was always happy to answer the questions we had, no matter how trivial or repetitive. We thought it was such a good idea that some parts of his appointments were conducted by midwives; it made turning up to hospital in labour just that little bit less scary. Having rooms in the CBD also meant that my husband and I could attend the appointments in our lunchbreaks, rather than continually having to juggle work commitments. We are incredibly thankful for Sean’s care and patience during the birth of our daughter at the Mater. He was with us in the delivery room much longer than expected, and let the labour progress naturally rather than intervening too early. We are also grateful for the care he offered us in the days after the birth; he dropped by to ensure we were all well and to help in any way he could. As first time parents we felt well looked after and reassured at all times. We have already asked Sean to look after us during our next pregnancy, and it goes without saying that we would highly recommend him to everyone. Sean was recommended by my GP, I was initially disappointed because he didn’t attend the SAN which is our local hospital but him having rooms in the city made it so easy to go to appointments during the pregnancy without having to take afternoons off of work. We delivered at the Mater which I have been to for a prior surgery and it’s a great hospital. the extra 15 minutes drive really was no inconvenience at all . Sean was amazing throughout the pregnancy he took the time to answer any questions and also make sure he was available outside of appointments by phone. this was particularly handy when my husband was diagnosed with shingles in my third trimester . I also had problems due to prior illness with some of my medication levels and Sean made sure he was on top of this too. My Bub came one week prior to my scheduled C-section in the middle of the night. Sean came to the mater immediately and delivered Alexander without any complications my husband and I felt confident the entire time that we had made the right choice in going with Sean. he could move to any hospital and I would gladly follow to have him deliver my second child! We’re so happy we chanced upon Dr. Sean. We found him to be not only a great doctor but a great human being as well. He was always very patient with us and encouraged us to ask as many questions as we had. He even proactively gave us his mobile number, in case we had any questions or needed help in case of emergency, which gave us a lot of peace of mind throughout the pregnancy. At the time of delivery, he took extra precaution and time with the stitches as I told him about the horrible experience I had with stitches during my first delivery with another doctor. The rest of the staff (midwife Ben and receptionist Debrah) are also great. We highly recommend Dr. Sean and the clinic to anyone looking for an Obstetrician! Dr Sean was fantastic and everything that I was looking for in an obstetrician!! He was very relaxed and chilled out, yet helpful and informative in the lead up to the birth. He never forced any opinions or ideas upon me which I really appreciated and made me feel comfortable and confident in making informed decisions. During the birthing process, Sean was so calm, gentle and really brought an air of assuredness to the birthing suite. After the baby was born, I was in hospital for 5 days and he made the effort to stop by and check in on me every day which was amazing for a first time mum, as it gave me the reassurance that everything I was feeling and experiencing was perfectly normal. Dr Burnet delivered our baby girl in April 2017 via elective C section. This is our first child and we could not be happier with the care and experience Dr Burnet provided throughout the whole pregnancy and birth. He is incredibly kind and considered in his approach, providing a calming presence. He is very thorough in both his examination and responses to any questions. On several occasions i texted Dr Burnet with some concerns only to receive a call straight away to put my mind at ease. My C Section delivery was incredibly smooth and actually a very enjoyable experience despite my inital fears of needles and surgery. Dr Burnet is a skilled surgeon having left me with a very neat and almost invisible scar-even the NSP nurses commented about how good my scar looked relative to others they had seen. From a practical view, Dr Burnet has 2 offices which made it very convenient and he was always on time for appointments which was incredibly helpful for getting back to work on time. I highly recommend Dr Burnet and cannot wait to go back to him for baby No. 2! Sean was recommended to me by a friend and I could not have wished for a better obstetrician. From the very first appointment Sean’s professional and caring manner is evident. He monitors the progression of yourself and the baby thoroughly at each appointment and ensures any questions or concerns you have are answered and alleviated. Sean’s calm demeanour and expert surgical skills meant that my caesarean operation was a great experience and the scar is minimal. I highly recommend Sean to anyone that is pregnant!! Thanks Sean for your compassion, support and expertise throughout my pregnancy, the delivery and beyond. 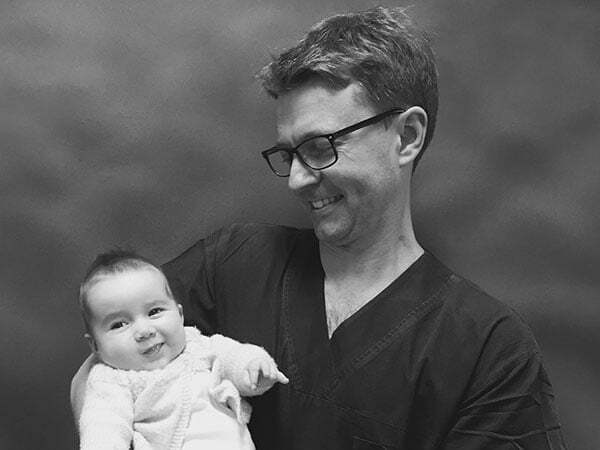 There are so many firsts when you decide to have a child and I was so glad Dr Sean Burnett and his team were there to guide us through the pregnancy and the birth of our little girl. From the very first phone call to make an appointment (where Sean called me just to have an initial chat) right through to the birth, Sean’s calm, professional demeanour helped me feel confident about every step of the process. Sean offered information and his professional advice and I always felt well supported in the decisions made during pregnancy and in the lead up to the birth. The clinic midwife Ben was also a great source of information and they both were proactive on following up on any questions I may have had in between visits. When I reflect on the birth itself – I couldn’t have asked for a better person to have been there than Sean. He was calm – which helped me maintain calm – and confidently guided me and my partner through the process. It was the perfect way for our little lady to enter the world. Sean was also great in following up; visiting us in the hospital and even phoning me on a public holiday to see how we were going at home. I couldn’t recommend Sean and his team more highly. Dr Burnett is everything we could have asked for in an obstetrician! When we found out I was pregnant we didn’t really have any idea of what to look for in an obstetrician and we were dubious if I even needed one. After talking to some friends we decided that we would seek one out and so we got some recommendations. Dr Sean Burnett was referred to us by a friend who is an experienced midwife. I’m so glad we picked Sean now after experiencing his warm and gentle service and knowledgable advice. He was always incredibly friendly and calm and ensured we were comfortable with everything that was happening and changing during the whole pregnancy. He was very flexible with appointments, accessible and happy to answer all the questions we had (there were lots being first time parents). As I approached full term I became increasingly appreciative of having an obstetrician who knew me and the particulars of my health. The real crunch was during the birth of our child. I went in for a check-up and my blood pressure was high. Dr Burnett was proactive in getting additional tests done immediately and we found some signs of Pre-eclampsia. He then made the decision to have me induced that day! Dr Burnett was available throughout the day from the early labour and his midwife kept him informed with my labour progress. When the time came to make the decision on an epidural he offered advice to help me make it. When I was fully dilated he was there and was proactive in every aspect of the delivery – including an episiotomy. He got my husband involved in helping me push and breathe and when the time came my husband was given the scissors to cut the umbilical cord. On reflection it made it a really special time for my husband and I. Every case is different and I felt that Sean was in control and proactive for the entirety of mine. I couldn’t recommend him more highly and upon speaking to other women in hospital, they had heard only exceptional reports of him too. Sean came to visit several times in hospital post birth and in follow up consultations he gave me plenty of advice about the healing process. We can’t recommend him enough! I would highly recommend Dr Sean Burnet. This is our first baby and he was very thorough in answering all our questions throughout the entire pregnancy. Dr Sean Burnet is highly compassionate about ensuring his patients’ questions are answered in a calm, considered and a compassionate manner. He has a great sense of putting his patient’s mind at ease and always accessible. What sets him apart from all other OBs is that he genuinely cares for the state of mind and well being of his patients. We are entirely grateful for the care he has given to me and my baby. Dr Sean was recommended to us and was well worth the travel for the peace of mind and expertise that he provided. Both Sean and his team made us feel comfortable and well looked after at every appointment and went above and beyond to provide reassurance with any concerns or questions that we had in anticipation of our first child. Dr Sean is a highly knowledgeable and experienced obstetrician who provided the upmost professional care both at our antenatal and postnatal appointments and during our delivery. He ensured I felt comfortable and at ease during physical checks and ensured my wishes for the delivery were understood and followed through. Being our first child and not knowing what to expect, Dr Sean put my mind at ease, providing a safe and calm environment which allowed me to feel safe and in control during my delivery. He approached all aspects of my delivery and postnatal care with the upmost respect and care, providing continual reassurance and ensuring all my needs and requests were met along the way to ensure the safety of myself and our child. We have no hesitation in choosing Dr Sean for our next child and highly recommend his services. Thank you Dr Sean! We are tremendously appreciative of your care and cannot thank you enough for the safe delivery of our beautiful baby boy! We had our first baby with Dr Sean as obstetrician. He and his team were absolutely wonderful. Sean went completely above and beyond our expectations to make the pregnancy and birth process as comfortable and calm as possible. We could not have wished for a better obstetrician. Not only did I receive excellent medical care, Sean was also fantastic with managing those other aspects of having a baby which extend far beyond just the physical medical care. He made sure all of my questions were answered, my wishes respected and also that my husband was well cared for too. Sean’s after birth care was equally fantastic. He really took time to do not only the physical checks but also to listen and allow me to download my thoughts and any concerns afterwards too. We hope to have another baby in the future and if this happens I would not consider another obstetrician. Thank you Sean. We are forever grateful for how well we were all looked after.